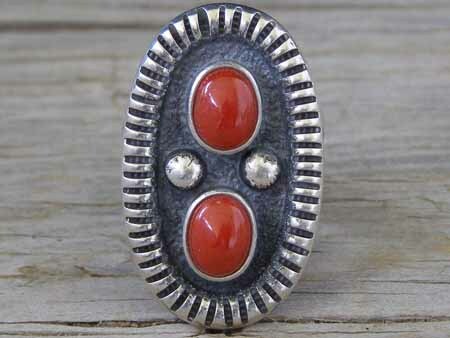 Not quite forty years old, Harrison Jim is an accomplished silversmith who works in many styles but favors the classic designs best described as Navajo Traditional Revival. His work is done in the old-fashioned way by melting silver and hammering it out to form his pieces. Superbly rendered in the weight and solid construction so characteristic of Harrison's work, this ring is set with two ovals of Mediterranean red coral. A length of handmade low dome wire was added to define the border of the ring face and notched with a cold chisel. The finish on the ring face around the coral appears to be sandcast, but a wholly different technique was used to create this finish. In this technique, the surface was heated up with the jeweler's torch and filings of silver are sprinkled on the hot metal causing them to melt and create a stippled finish. The coral ovals, of course, were set after this process was completed. The shank consists of three lengths of hefty, handmade wire fused at the back of the shank and spread apart to create a split shank before attaching to the ring back. Beautiful smithing in a gorgeous Traditional Revival style. Hallmarked by a jeweler's scribe inside on the ring back as "HJIM" (where the "H" is above the "J" in "JIM"). Red Coral: 2 ovals 3/8" x 5/16"
Ring face: 1 7/16" x 15/16"
Width of shank in back: 5/16"